The fighting in Rhodesia arose from black demands for majority rules in a colony governed buy whites. 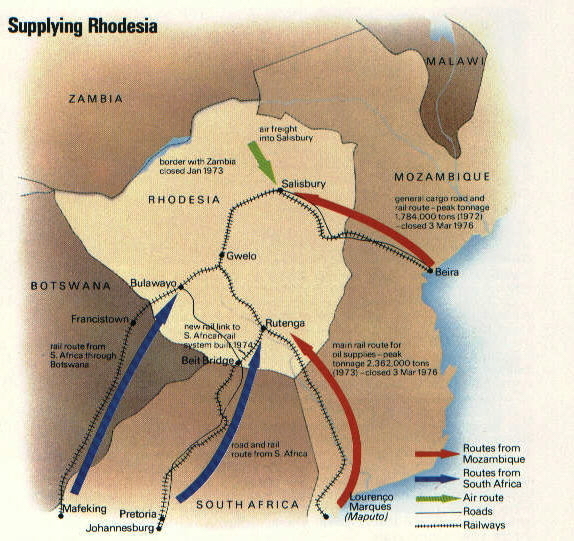 The genesis of the conflict in Rhodesia may perhaps be traced back to the decision by the British government to grant responsible government to the white settlers in Southern Rhodesia in 1923. Although legally they could only govern their own affairs, in practice they were frequently left, as the people on the spot, to interpret and put into effect laws applicable to the whole population. 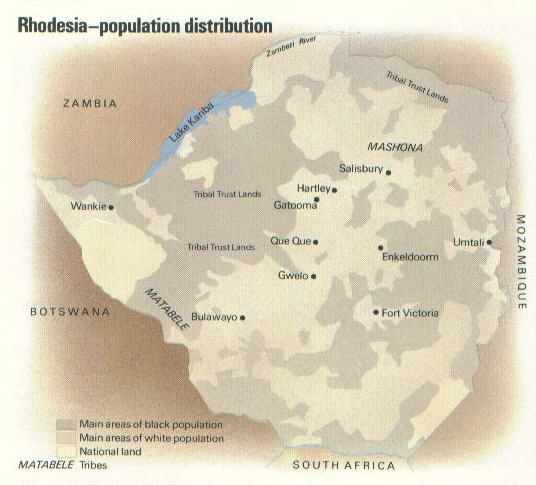 In 1923 there were some 35,000 whites and 900,000 blacks living in Southern Rhodesia. Inevitably there grew up a bitterness on the part of the few educated blacks when they saw, for example, the results of the 1931 Land Apportionment Act which allocated 28 million acres to 1 million blacks and 48 million acres to 50,000 whites. In 1953 the colonies of Southern Rhodesia, Northern Rhodesia and Nyasaland were linked together in what came to be known as the Central African Federation. From the beginning the white settler government of Southern Rhodesia dominated the federa­tion politically and economically. By 1957 the blacks in Southern Rhodesia had formed their own political organization, the African National Congress (ANC) which was led by Joshua Nkomo. The ANC attempted to pursue moderate policies so as not to alarm the white population: they campaigned for an end to racial discrimination and more economic progress for the blacks. 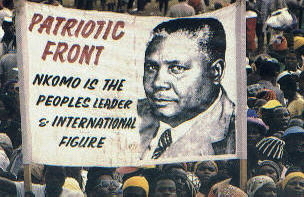 Nkomo was seen by the whites as a moderate and initially participated in the politics of the federation. But despite its policy of moderation the ANC was banned in 1959. Nkomo was out of the country when this happened but many of the movement’s leaders were detained and the government of Southern Rhodesia introduced a series of measures to control the growth of black nationalist disaffection. A new nationalist political group was formed in 1960: the National Democratic Party (NDP) led by Joshua Nkomo, the Reverend Ndabaninge Sithole and Robert Mugabe. Their supporters hoped that the federation would soon collapse and majority rule would be forced on the Southern Rhodesian government by the British government. At the constitutional conference of 1961 (to which the NDP was invited) the existing government in Southern Rhodesia was given almost complete authority over the colony’s affairs, however. Attempts to disrupt elections under the new constitution led to the banning of the NDP, and in December 1961 the Zimbabwe African People’s Union (ZAPU) was formed. Nkomo went abroad to seek support from Britain and the United Nations, leaving the remainder of the leadership in Southern Rhodesia. Under criticism because of his moderate stance, he hastened back home and began to campaign for the use of violence, as a last resort, to achieve ZAPU’s aims. In September 1962 ZAPU was, in its turn, banned. The growing militancy of the nationalists led to a strong reaction on the part of the white population. 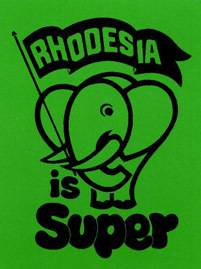 A new political party of the right — the Rhodesian Front (RF) — was swept into power in the 1962 election, mandated to resist any ‘sell out’ to the black population. Once in power the RF crushed the nationalist movement and established a strong, often harsh, system of law and order. As a result, when the Central African Federation collapsed in 1964 and out of the ensuing turmoil Northern Rhodesia became Zambia and Nyasaland became Malawi, both independent, the only really stable regime in the area was that presided over by the RF in Southern Rhodesia. In the early 1960s the black nationalist leaders were in disarray: they could not agree on the best policy. Nkomo wanted to establish a government in exile while the others, fearful of a loss of internal support for their cause, sought to remain in Southern Rhodesia. In August 1963 Sithole formed the Zimbabwe African National Union (ZANU), a rival party to ZAPU but with the same broad aims of majority rule. Gang warfare broke out between the two parties and there were clear signs of a split based on tribal allegiances, a factor which was to continue to plague the nationalists’ cause and to restrict the support for the Zimbabweans from other black southern African states. 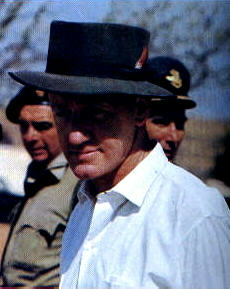 Ian Smith became Prime Minister of Southern Rhodesia in 1964 and he immediately promoted the idea of independence on the basis of the existing constitution. The British government, however, was resolute in its determination to withhold independence without safeguards for the black population. After the breakdown of negotiations Smith announced a unilateral declaration of independence in November 1965. Discussions between Smith and Harold Wilson in 1966 and 1968 were unsuccessful and Britain, later followed by the UN, imposed economic sanctions on Southern Rhodesia. Sanctions were, however, never fully effective, largely because South Africa and the Portuguese government (the latter still in control of Mozambique) were sympathetic to the Smith regime. After being banned in 1964 both ZAPU and ZANU moved their headquarters to Zambia and began to build up guerrilla armies. Initial penetrations into Rhodesia by guerrillas failed completely and attempts to infiltrate in co-operation with South African National Congress guerrillas met with a similar fate. Indeed, the latter made matters worse for the nationalists as co­operation with South African guerrillas provided the excuse for the Rhodesian government to invite South African para­military police contingents into the country to bolster the Rhodesian security forces. In the late 1960s ZAPU and ZANU quarreled incessantly; there were further signs of a breakdown within each organization on tribal grounds, and the Zambian government grew more and more irritated and then anxious about the ill disciplined, numerous but ineffective armed guerrillas in its country. In 1971, the Smith government accepted the terms of a British proposal to resolve the crisis and it was agreed that the settlement should be tested by a British Commission in Rhodesia before it was finally approved. The Salisbury government was confident of a ‘yes’ vote and was amazed by the support for a ‘no’ vote whipped up by a new black political group — the African National Council — formed in 1971 and led by a then little known figure, Bishop Abel Muzorewa. The Methodist bishop had until then always contented himself with moderate criticism of government policies from his pulpit. The 1971 settlement attempt failed, largely as a result of Muzorewa’s efforts and in 1973 there followed a strong upsurge in guerrilla activity which forced Rhodesia to close the Zambian frontier. This mounting guerrilla campaign marked the beginning of the real war between black nationalists and the white government. 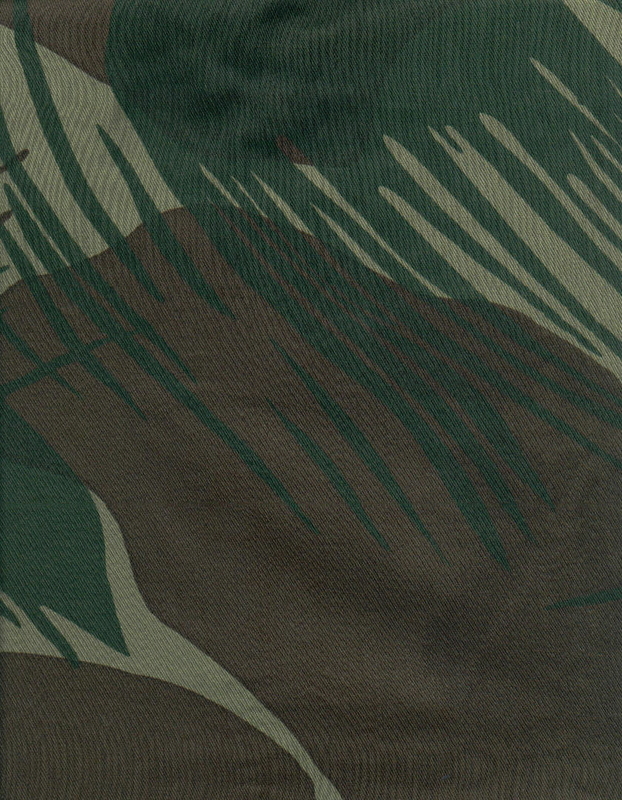 By now, the guerrillas had gained access to more and better weapons; they were rather better trained and, of greatest importance, were assured of more sympathy and support from the black population in Rhodesia whose political awareness had been sharpened, paradoxically, by the success of Muzorewa’s non-violent methods. The next development of critical importance was the end, in 1974, of Portuguese rule in Mozambique. The appearance on the scene of a black government in Mozambique Favorably inclined towards the aspirations of the Zimbabwe nationalists had a number of effects on the situation, not only in Rhodesia, but in southern Africa generally. South Africa, now the only neighboring country friendly to Rhodesia, grew more anxious to disengage from obvious support for the Smith government. Pressure was brought on the white Rhodesian leader to reach a settlement with the nationalists and all South African police units were withdrawn in 1975. Reacting to this South African pressure and fearful that the war might intensify, the Rhodesian government attempted to negotiate with Bishop Muzorewa. The initiative failed but other nationalists were released from detention and, following an apparently successful attempt to link Muzorewa’s ANC with ZAPU and ZANU, Smith conducted negotiations with the complete group. Nothing came of the talks and a proposed ceasefire arrangement collapsed. The attempt to unify ANC, ZAPU and ZANU was opposed by some black nationalists, notably Robert Mugabe and also the guerrilla army leaders of both ZAPU and ZANU. As a result the ZANU faction with its army, the Zimbabwe African National Liberation Army (ZANLA), established itself in the now friendly territory of Mozambique. In 1976 a renewed campaign of guerrilla activity was initiated from Mozambique and further attempts by the Smith government to negotiate with Nkomo’s ZAPU ended in failure. Mozambique closed its frontier with Rhodesia in 1976 and the country was now effectively reduced to relying on South Africa’s goodwill in all matters. South Africa, however, was now anxious to end the war in Rhodesia, and through the mediation of Prime Minister John Vorster of South Africa a meeting was arranged between Ian Smith and Henry Kissinger, the American Secretary of State. At the meeting the pressure was on Smith, now effectively facing the world alone, and he was forced to announce that he had at last conceded the principle of majority rule. Kissinger put forward a joint American/British plan to implement their agreements and it was arranged to hold a conference to which all factions would be invited. At the conference which followed in Geneva the nationalists proved to be once more in disarray, in spite of an agreement merging ZAPU and ZANU into a new alliance called the Patriotic Front. They could agree to nothing except a bitter dislike of Ian Smith and the rejection of the Kissinger proposals unless they were modified. Smith, himself, refused to enter into discussion of the Kissinger plan which he would only accept as it stood, unamended. Stalemate was almost instantly reached and the meeting disintegrated. Now the Rhodesian government rejected further American or British initiatives and decided to go for an agreement with Bishop Muzorewa on the basis of ‘one man one vote’ in what came to be known as the ‘internal settlement’. A mixed white and black transitional government came into being on 3 March 1978 and was bitterly opposed by Nkomo and Mugabe. Nonetheless elections, held in April 1979, led to Bishop Muzorewa becoming the first black prime minister of what was now called Zimbabwe-Rhodesia on 1 June. The Muzorewa government was, however, doomed to failure. By seeming, too readily, to adopt the policies advocated by the whites, the bishop had left himself wide open to criticism from ZAPU and ZANU who gained increasing popularity among the black population in the country, partly because they were suspicious of the outcome of Muzorewa’s tactics and partly because the guerrilla armies were becoming more and more successful. The Muzorewa government was, however, doomed to failure. By seeming, too readily, to adopt the policies advocated by the whites, the bishop had left himself wide open to criticism from ZAPU and ZANU who gained increasing popularity among the black population in the country, partly because they were suspicious of the outcome of Muzorewa’s tactics and partly because the guerrilla armies were becoming more and more successful. Throughout 1977 to 1979the guerrilla attacks, especially out of Mozambique, increased in intensity. Despite extremely effective, if on occasion over ruthless retaliatory attacks by Rhodesian security forces into Mozambique, Zambia and even Angola, there was no doubt that the government was finding it increasingly difficult to maintain its authority throughout the country. Large tracts of land, especially in the north—east, were dominated without challenge on a permanent basis by the guerrilla organizations. Recognizing that the Muzorewa government would be faced with a continuing war that it could not win and that the surrounding black African states were beginning, for political and economic reasons, to weaken in their resolve to support ZAPU and ZANU, the British government seized the opportunity to promote the idea of a new con­ference to resolve the deteriorating situation. By forthright bargaining and persuasion of all the parties involved, which included seeking support from the interested black African states, a solution was found. 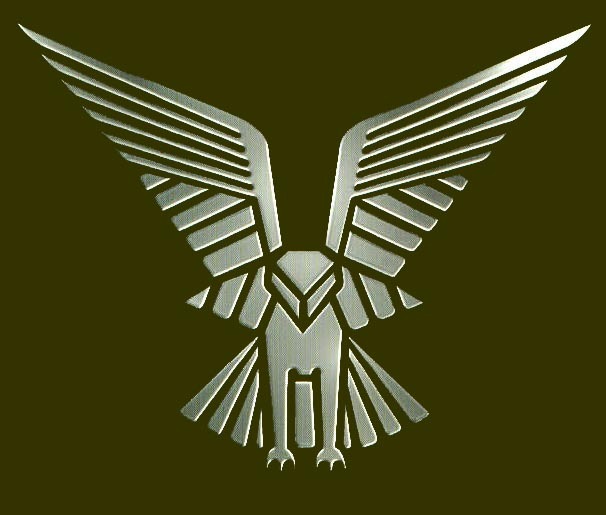 The plan was one of an extremely delicate nature involving the assembly of the guerrilla armies at rendezvous on Zimbabwe-Rhodesian territory under the supervision of Commonwealth troops while the existing security forces retained responsibility for law and order. This daring enterprise worked and elections were held under British supervision which resulted in a government based on one man one vote being formed in March 1980 under the leadership of Robert Mugabe, who had won a resounding victory. 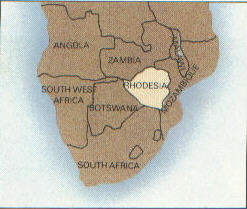 The following month Rhodesia formally became the independent state of Zimbabwe. ***NOTE*** Source for this article was obtained from the book: WAR IN PEACE: CONVENTIONAL AND GUERRILLA WARFARE SINCE 1945. printed 1982, author Major F. A. Godfrey MC.